Tigerino Crystals cat litter has a new package design. It's still the same top quality litter, just with a new look! Please note: During the change-over period your order may include both the old and the new package design. This litter absorbs huge amounts of liquids and odour in a unique way: Tigerino Crystals can absorb nearly its own weight in liquid. Urine, odours, and germs are absorbed in seconds. Moisture evaporates while odour molecules stay bonded in the crystals. The countleΒ micro-pores in Tigerino get rid of the moisture immediately and keep the litter box dry. Benefits of Tigerino at a glance: Stops odours in seconds Extremely absorbent - light and efficient Simple, dust-free use Anti-bacterial - seals germs in the core Compostable and eco friendly Yield of 5l Tigerino: 1 cat: approx. 25-35 days 2 cats: approx. 15-20 days 3 cats: approx. 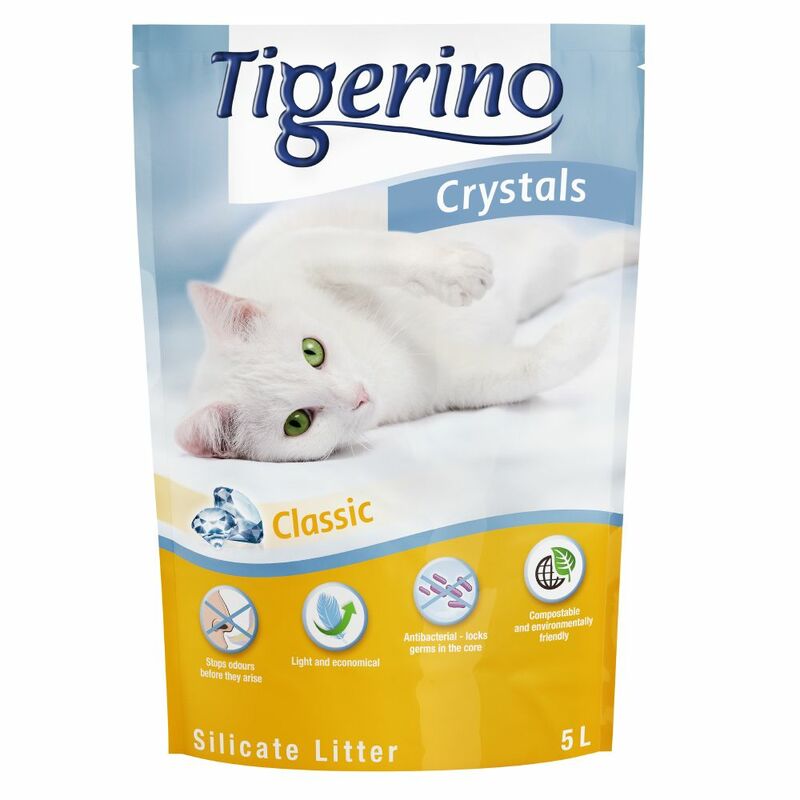 8-12 days For further information regarding the different varieties of Tigerino cat litter contained in this mixed trial pack, please click on the following links: Tigerino Crystals Silicate Litter.